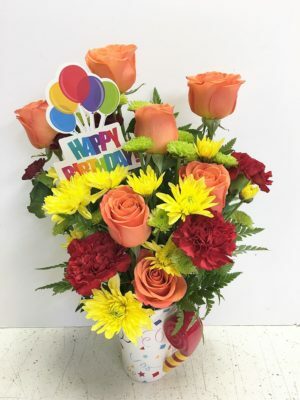 We have a limited supply of these terrific Happy Birthday mugs, a tall celebratory reusable cup, that we load to the rim with festive flowers such as orange roses, red carnations and yellow mums. 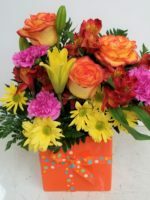 Certain to please that birthday boy or girl, we know everyone will give a “thumbs UP” when they see this fun, festive Happy Birthday floral arrangement! 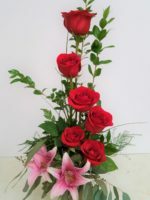 Happy Birthday’s Fun for all your friends and family! 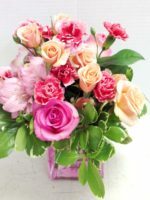 We love celebrating birthdays!! 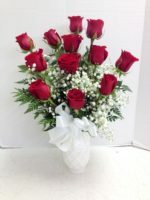 Next to babies they’re our favorite occasion to send fresh flowers. 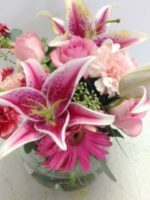 By choosing Roadrunner Florist for your floral needs, you are selecting one of Phoenix’s finest flower shops! 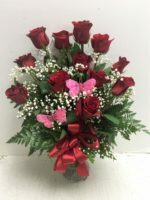 Pamela E Smith, Michigan State University Floriculture Graduate, has been designing amazing creations for more than 50 years! 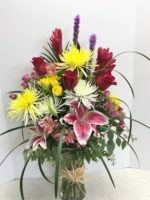 We are happy to deliver this adorable arrangement throughout the Valley of the Sun, and if necessary, substitute the flowers and/or the container to another Happy Birthday cup or mug. 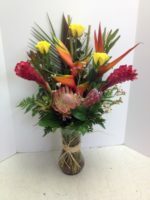 Looking for something short and sassy: Try our Short & Sassy Arrangement or our Hawaiian Style Birthday Party Arrangement.